On the Philippine island of Mindanao lies the Hinatuan Enchanted River. Situated between the crystal-clear waters of the Pacific Ocean and the Philippine Sea, this beautiful river with its memorizing color and beauty has attracted visitors from all over the world. The Bay of Hinatuan is located in the region of Surigao del Sur, and just one look at this magical river will make visitors yearn to come again. The international interest in the Enchanted River is relatively new, dating back to 1999, when a diver explored the underground cave associated with the river. Over the next few years, teams of divers and explorers tried to examine underwater area of the Hinatuan Enchanted River. Some of the locals state that the gorgeous color of the river was created by the fairies of the island in order to entice visitors. Fishermen have tried, unsuccessfully, to catch fish in the river. The locals believe that some kind of spell has been placed on the river, protecting it from being destroyed or its fish from being taken. Another local legend states that the spirits of the locals come to the Enchanted River during the late evening and night to “go for a swim” and relax, which is why the Enchanted River facilities close at this time. Many locals choose not to swim in the Enchanted River, so as not disturb the resting spirits. They believe that whoever swims in the river will emerge from the water with aches and pains throughout their body as punishment. The Hinatuan Enchanted River is known for turtles that swim around the mouth of the Hinatuan Bay, and there is also a myriad of beautiful fish that swim in this clear, turquoise water. The river is only 50 feet long, meaning it only narrowly makes the cut to be called a river. It seems to appear out of nowhere due to its enclosed shape and its form, which extends all the way to the ocean. Concealed between high, rocky mountains, the Enchanted River can be accessed only via a dirt road. Even though tourists may be skeptical about traveling down this lonely path, their worries vanish when they take one look at the river. Palm trees, wild flowers, sea turtles, and clear blue water create the gorgeous beauty that is the Enchanted River. The Enchanted River is not only known for its amazing water and sea life, but also for the special feeding ritual of the fish. Just like clockwork, every day between noon and 3:00pm, the local lifeguard and caretaker feeds the fish, in a manner unlike anything ever seen before. Through a loud speaker, the Hinatuan Hymn is played, both for the people and for the fish swimming in the water. The ring of a bell indicates to the swimmers that it is time to get out of the water for the fish feeding. Just like Pavlov and his dogs, the fish have been conditioned to swim up to the caretaker of the river for their mealtime. Sometimes visitors are allowed to help feed the fish by throwing cooked rice, shrimp, and minced octopus into the water. Once the fish have been fed and have a full stomach, they “disappear” into the water and swimmers barely notice them again. While swimming in the Enchanted River is allowed during the daytime, the locals will usually refrain from taking a dip in the sacred water at any time of day. 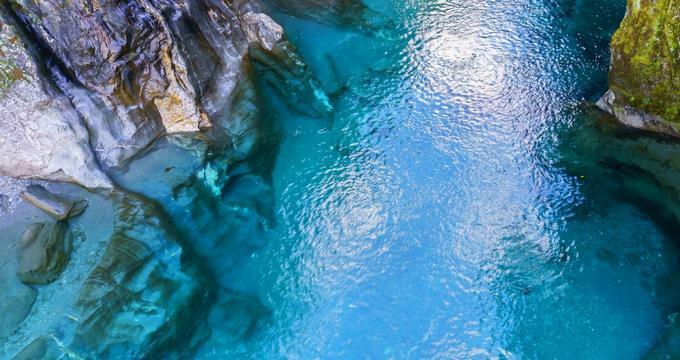 Visitors can go snorkeling in the river to catch a glimpse at the different species of fish, while the crystal-clear blue water is highly enticing, offering visitors an experience of what true natural beauty looks like. At 5:00pm, the facilities at the Enchanted River close down for the day and swimming in the river becomes officially prohibited. Due to the bad weather typical of the season, swimming in the Enchanted River is banned from the beginning of January 2017 until mid-March 2017. The swimming ban is slowly being lifted, and a “soft reopening” will occur, whereby visitors and the weather will be monitored on a closer basis. Cottages, picnic areas, and lounge areas have been placed around the river for the comfort of visiting tourists.